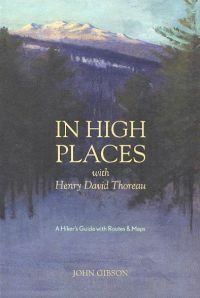 In High Places with Henry David Thoreau, by John Gibson, 2013. Veteran New England hiker John Gibson takes readers on a tour of the mountains that Thoreau during his extensive travels around the region. Included are Katahdin, Kineo (Moosehead Lake), Washington, Lafayette, Monadnock, Pack Monadnock, Wachusett, Greylock, Wantastiquet and Red Hill. The author provides trail descriptions and maps for each mountain along with Thoreau quotes and commentary. From the back cover: "These pages are an invitation to ascend with Thoreau, to experience today that same high terrain he found so important and inspiring." 196 pp, 5 1/2" x 8 1/4,"